When a John Doe washes up on the shores of Calico Bay, no one knows who he is-including him. But one thing's instantly clear to deputy sheriff Audrey Martin: the man's marked for murder. And she's the only one who can protect him from the assassins who lurk at every turn. The arrival of a team of men claiming he's Canadian Border Services officer Nathanial Longhorn only further complicates the matter. As his memories slowly start drifting back, Nathanial's determined to work with Audrey to uncover who wants him dead and why. But he's tangled in something that threatens to submerge them both. And unless Audrey can help him figure out what, this Christmas might be their last. I found this book to be very exciting! It held and kept my interest from the first page. I've always enjoyed amnesia stories and this was a good one. I'm fascinated by them! In this case, imagine washing up on the shore of a Maine beach and not knowing if you are a good guy or a bad guy??!! That is the case with this John Doe (aka Nathanial Longhorn). All he knows is that someone is trying to kill him, as if washing up on a freezing beach isn't bad enough! Thankfully, Deputy Sheriff Audrey Martin is the one that finds him and she is not about to let anyone murder someone in her town! I loved Audrey's character. She went with her gut so many times, even though outward appearances might have shown that John Doe wasn't an upstanding person! She could see by subtle things that he was someone who had military or law enforcement background! I also liked how she stood by him the whole time and wouldn't leave him even when they discovered who he was - even when his amnesia continued. This was a really good story and I liked all the characters. Previous characters from other books made appearances but you don't have to read the other books to know what is going on. Each book is a separate case. I really liked this book!!!! Amnesia cannot stop the killers. Can Audrey? I loved this book! I didn't want to put it down! 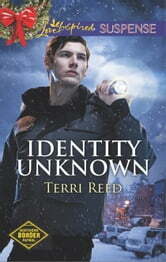 So glad I received an early copy of this book from the author Terri Reed in exchange for an honest review. I enjoyed reading all the Northern Border Patrol books and am sorry that this is the last book in the series. Even though this book is part of the Northern Border Patrol series, it can be read alone. Author Terri Reed did a great job by using Canadian Border Services officer Nathanial's amnesia as an opportunity for the other members of his team to remind him and deputy sheriff Audrey of Nathanial's past and their relationships. There was a lot of action in this fast paced book that kept me reading. The characters were people you would want to be friends with and to protect. Their actions were believable. I really liked the ending. If you haven't read the other Northern Border Patrol books, I think you would like them. Reading them would give you a chance to get to know some of the other team members.